1204 PERCOL Dopey Soup is a hand mixed version of Elastic Cement and is supplied in convenient six packs (3 half gallons each of "A" and "B"). Combined with aggregates, it forms a high performance, quick setting, flexible polymer concrete. Within an hour of placement, durable repairs are ready for traffic. Withstands vibration, heavy traffic loads, and thermal movement. Available in Gray and other colors on special order. Used in control joints. For repair of Concrete and Asphalt. 1208 PERCOL GeoSet Rapid Concrete Repair Slurry is supplied in five gallon kits. 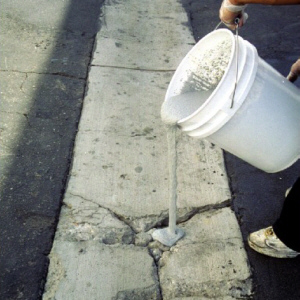 Geo-Set is for repair of concrete spalls and restoration of concrete at the joints. Odorless, non-flammable, fast curing & strong, this concrete repair kit is a pourable slurry that is easily poured into wide cracks and spalls. It bonds without priming. Broadcasting uniformly graded sand on uncured Geo-Set creates a high traction surface. Supports traffic in one hour! Percol GeoSet Concrete Repair Kit Includes Everything You Need To Complete Your Concrete Repair! Click here for Crack Calculator, Product Calculator, and Coverage Chart. Concrete Repair Aggregate Topping Sand for Anti Skid Wearing Surface to Keep Your GeoSet Concrete Slurry, Concrete Welder, and Elastic Cement Polymer Gray. Use for an anti-skid and wearing surface by topping the repair (while wet and before set up of polymer or slurry) with our Concrete Topping Sand. Mix your materials and apply as you would with our standard process. Use topping sand generously on the GeoSet, Concrete Welder & Elastic Cement Polymers with our Concrete Topping Sand. When the material has set up, sweep off access sand and your concrete repair is ready. We recommend that you use our specially-coated sand because it bonds better to our products than other sands. If a gray repair is essential, use Concrete Topping Sand! Available in 12 pound bags. Note: These video demos are for GeoFlo Asphalt Repair Slurry, and/or GeoSet Concrete Repair Slurry. The mixing procedures are the same for both GeoFlo and GeoSet. Percol Cold Weather Catalyst - 1 oz. Vial. Can be used to assist in GeoFlo and GeoSet curing times when the temperature is colder than 75 degrees.